(CNN) -- Mohamed Ould Abdel Aziz, who came to power last year after a military coup, claimed victory Sunday in Mauritania's presidential election -- though one of his main challengers claimed fraud marred the polls. 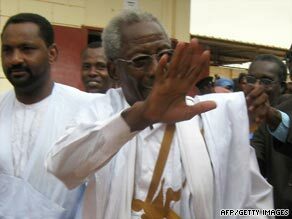 Presidential candidate Messaoud Ould Boulkheir arrives at polling station Saturday to cast his ballot. "I am president of all Mauritanians," Aziz announced at a news conference, according to state-run Mauritania Information Agency. The news agency reported that Aziz was leading the nine candidates in early returns, with about 52.5 percent of the vote. Other election data was not immediately available. Meanwhile, a campaign official for Messaoud Ould Boulkheir, one of the main contenders, said the election was fraudulent and reiterated his confidence in his camp's victory. Boulkheir will recognize all election results if the vote was credible, but any other scenario will be vigorously rejected, Yahya Ould Sid'Elpoustaph told reporters. Aziz called the election free and fair, and said he was not concerned if other candidates called the results into question, the news agency said. He said investigating any allegations stemming from the election would be a matter for the Interior Ministry. Aziz, a general, came to power after a bloodless coup ousted President Sidi Ould Cheikh Abdallahi, on August 6, 2008. Abdallahi, the country's first democratically elected leader, had issued earlier a decree dismissing Aziz and three other senior military officers, according to the U.S. State Department. The coup drew harsh criticism from U.S. officials, including then-Secretary of State Condoleezza Rice. "We oppose any attempts by military elements to change government through extra-constitutional means," Rice said in a statement at the time. "We call upon the military to release President Sidi Ould Cheikh Abdallahi ... and to restore the legitimate, constitutional, democratically elected government immediately." The West African nation of 3 million people has had multiple coups since it won independence in 1960. Mauritania's election was scheduled for June, but was later moved to July to allow more time to campaign. Abdallahi did not make another run.